sportsmatrix » Can Bayern Blunt Barca’s MSN Trident? Can Bayern Blunt Barca’s MSN Trident? There have been times during the season when Bayern Munich have appeared to be unbeatable, often steamrollering the weaker Bundesliga teams; but in eight league games against teams currently second to fifth in the table, they have picked up only nine points out of a possible 24. Defeat to Borussia Dortmund on penalties last week in the DFB-Pokal ended Pep Guardiola’s chance of a treble and with several key players out injured, overcoming Barcelona may well be Guardiola’s biggest challenge to date. The good news for Pep is that the second leg will be played at the Allianz Arena, where Bayern have won all six games in Europe, racking up 19 goals and conceding only one. Since their 7-1 battering away to AS Roma in October, the Bavarians have lost twice and drawn once on their European travels. Robert Lewandowski should be fit enough to lead the Bayern front line and winger Franck Ribéry may possibly be fit to play in the second leg, but Alaba, Badstuber and most significantly Arjen Robben will definitely be unavailable for both legs of this tie. The absence of the mercurial Robben is undoubtedly the biggest loss for Guardiola, who has seen his team average three goals a game in the Bundesliga with Dutchman in the team and only 1.4 goals a game without him. Bayern’s win percentage with Robben in the team is a remarkable 86% but only 60% when he hasn’t played. Bayern have failed to score in three of the 10 games in which Robben didn’t feature and in only one of 21 when he played. When examining Bayern’s overall performances and Robben’s in particular from the SportsMatrix database, it is clear that the German champions play a more direct style, rather than relying on attacking flair to beat opponents when Robben doesn’t play. Although Robben is mostly involved in the latter stages of Bayern’s attacking play, he delivered the highest percentage (30%) of good passes in building Bayern’s attacks, averaging seven good dribbles per game. Once Bayern reach a more advanced attacking level Robben delivered close to five good passes and performed three good dribbles per game. Bayern averaged 19 chances per game with Robben in the team, converting 11% of these chances into goals. Without Robben they averaged 12 chances per game, converting 8% of into goals. With the Dutchman in the team, Bayern average more than seven corners a game, with 1.7 rated as being dangerous. In the games in which he didn’t play, they delivered approximately four corners per game, with only 0.3 rated as dangerous. 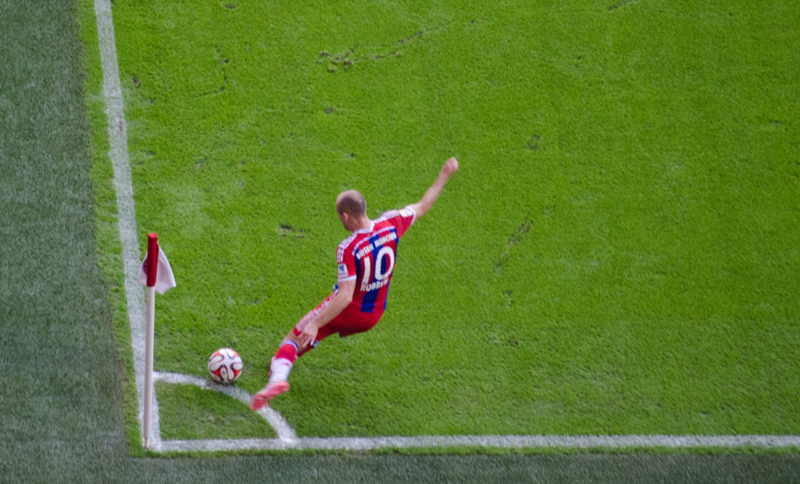 Robben delivered the most Bayern corner kicks (48), with a quarter leading to direct goal scoring chances. In the matches in which Robben featured, Bayern averaged more than 17 shots per game from open play; with five rated as being dangerous and with 2.5 resulting in a goal. Without the Dutchman, Bayern attempted 11.2 open play shots, averaging 1.1 goals per game. Robben attempted more shots on goal (82) in the Bundesliga than any of his teammates, averaging 0.8 goals per game; but in the games in which he played Götze (0.6), Shaqiri (0.5), Lewandowski (0.6) and Müller (0.5) also made significant goal scoring contributions. The one Bayern player to provide more of a goal threat in the games in which Robben has been absent, is Robert Lewandowski, who has scored six times and providing an assist in his last eight games. Bundesliga teams have had it easier when Robben hasn’t played, performing 34% fewer defensive actions and more than 45% fewer actions in high risk defensive situations. Even if Pep’s task of overcoming his former club seem daunting, especially with Messi, Suarez and Neymar on fire; it may well be that the absence of Robben is not so crucial after all, because in European games the Dutchman has not been particularly effective, scoring only two goals and providing one assist in 429 minutes of Champions League football. Lewandowski has delivered some outstanding performances and has been significantly more effective in the absence of Robben; whilst Thomas Müller has reserved his best performances for the Champions League, scoring six times and providing three assists. But perhaps it will be an ex-Barcelona player who will come back to haunt the Catalans, with midfielder Thiago Alcántara, the outstanding Bayern performer in both legs of their quarter final tie against Porto who could well make the headlines.